A.Vogel Pollinosan Hayfever Tablets (Formerly Luffa Complex) health supplement Includes Sponge Cucumber (Luffa), Heartseed, American Spikenard andother tropical herbs to help symptoms of allergies, especially hayfever. 3 different options. 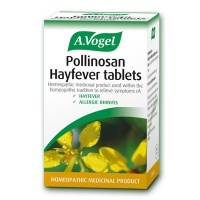 Pollinosan Hayfever Tablets Tablets for relief of hayfever and allergic rhinitis. Non-drowsy. No, Pollinosan tablets should not be used by children under the age of 12.